Hort Farm No. 2 in July 2013. I have seen as much disease damage on turf this summer as any year since I began living and working in New Jersey. The weather has been ideal for summer patch and brown patch diseases. Summer patch disease is caused by a root infecting pathogen, Magnaporthe poae. I have observed more damage on hard fescue turf than Kentucky bluegrass. This is likely due to the fact that many people are growing varieties of Kentucky bluegrass with better tolerance of the disease than was the case 20 or more years ago. Use seed mixtures (rather than blends) that include tolerant species when seeding hard fescue or Kentucky bluegrass as a major component of the turf. 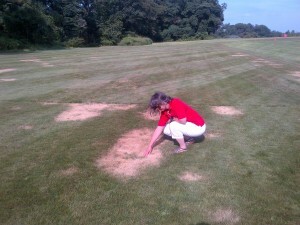 Hard fescue and Kentucky bluegrass (depends on the variety) are sensitive to summer patch. Seed with tolerant species which includes tall fescues, perennial ryegrass, and Chewings fescue. Chewings fescue can be damaged by summer patch disease but it is more tolerant than hard fescue as you can see in the image below. 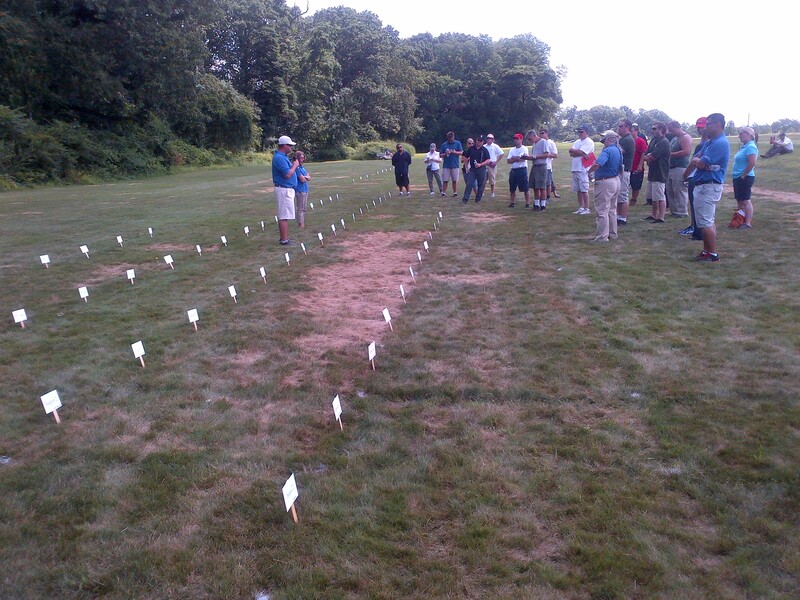 A range of hard fescue entries in an evaluation trial that were severely damaged by summer patch disease. Disease stops at the plot edge with Chewings fescue (line defined by plot signs at field day). Links below open PowerPoints on summer patch disease prepared by Dr. Bruce Clarke.